It was a banner week for race in America. Adrienne Curry, former America’s Next Top Model and reality TV star(?) explained why she’s boycotting BET and Black History Month. Bill O’Reilly was amazed that black people behave just like white people when they go to dinner at a restaurant. I have no problem dismissing Curry and O’Reilly as ignorant and/or attention-seeking — say something controversial and watch the hits on your MySpace page rise. Or your ratings, as the case may be. But what is Congress doing? My sister called the other day to ask what I thought of Mahmoud Ahmadinejad speaking at my alma mater, and I was all thumbs up for all sorts of reasons. 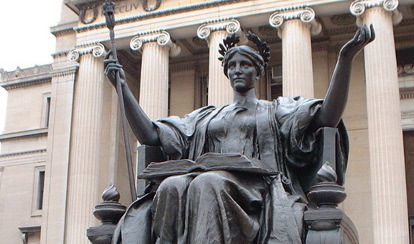 I wondered, though, if this controversy has drawn the nation’s attention to the other world leaders Columbia has invited to speak. It was of special interest to me as I write this play about a Bosnian American, that Columbia invited Željko Komšić to give a keynote address today. He is one of the three rotating presidents of Bosnia and Herzegovina. That’s right. Bosnia has three presidents. And you thought that one was a lot to worry about! I was sitting in the Bosnian equivalent of Legal Aid in Sarajevo when I first heard about their post-war presidency. After I reset my dropped jaw, I imagined how this system would work in America. Would Jon Stewart have to extend his show to an hour, or even an hour and a half, to cover material on all three presidents? Would Congress accomplish anything? Would they perhaps accomplish more as, knowing when to send their bills through. And perhaps the most interesting question: Which three groups would Americans want represented? Stars Are Dead. Love Is Alive. I hadn’t eaten in a little over twenty hours. I was hungry. It was 2:15PM on Saturday, on Yom Kippur, and I was sitting on a fold-up chair in The Angel Oransanz Foundation as people passed the microphone around, crying out the names of loved ones who had died. A friend. A sister. A parent. Sometimes, an entire family. Gone. I had never experienced communal crying. Even if you weren’t mourning the loss of someone, it would be hard not to cry. Comments Off on Stars Are Dead. Love Is Alive. This news story out of Nova Scotia just warms my heart. In the small community of Cambridge, a Grade 9 boy wore a pink polo shirt on the first day of school, and a group of older students harassed him with homophobic slurs and threatened to assault him. When David Shepherd and Travis Price, two Grade 12 students, heard about this, they bought at least 50 pink shirts to wear and bring to school the next day (including one for the boy who was bullied) — and, via e-mail, mobilized hundreds of their classmates to do the same. They estimate that about half of their 830 classmates joined in their protest. 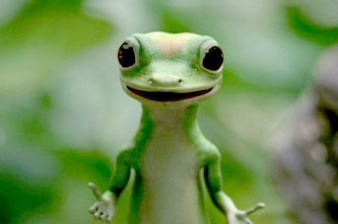 All hail the Geico ad execs. Tonight, ABC premiered a new sitcom—Cavemen a show based on the almost-funny Geico commercials where a caveman talks on his cell phone and whines to his shrink about the phrase, “So easy a caveman can do it.” No, I did not watch said show. I was busy getting stuck in an elevator with about four other Crucial Minutiaeteers. I didn’t DVR it either, because a) sitcoms and I generally do not get along and b) I always preferred the Geico Gecko commercials anyway. But I find it fascinating that an actual television show picked up by a major television network is based on a commercial. In fact, I would go as far as to call it an advertising coup. It’s on par with the 1988 release of Mac and Me, an alien buddy movie that’s pretty clearly a two-hour ad for McDonald’s. Geico is a company that has mastered advertising. While most commercials make me want to throw my television against the wall, Geico continually pumps out ads that are funny. I have to admit, I get a little bit excited when their most recent commercial airs—a Hard Copy-like look at how Wilma Flintstone could afford her signature pearls (answer: Fred saved a lot on car insurance).